We recommend you pre-extend in Delhi, with time to acclimatize and explore the city. Lunch at Claridges Hotel at 12.00, followed by a visit to the UNESCO World Heritage Site of Humayun’s Tomb, a garden-tomb built in 1570 that inspired several major architectural innovations culminating in the construction of the Taj Mahal, and then a tour of the Gurudwara Bangla Sahib, one of Delhi’s most important Sikh temples. 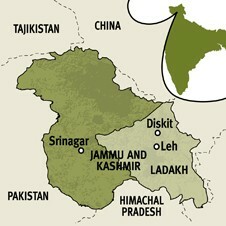 Delhi - Leh: Early morning flight to Ladakh affording spectacular views of the Himalayan and Karakoram Ranges. After arrival in Leh (3,524 m/ 11,562 ft), the capital of Ladakh, we drive to Saboo village and our hotel. We visit a traditional Ladakhi house where we have the opportunity to sample ‘butter tea’ and/or ‘chang’ (barley beer). A cooking demonstration followed by lunch will provide further insight into Ladakh’s cuisine. Afternoon free to relax and acclimatise. 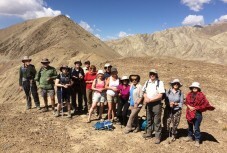 Leh (Saboo Valley): We explore the lovely Saboo Valley and its rural landscape on foot (3-4 hours with shorter/longer options), learning about the Ladakhi way of life. After lunch there is time to relax or optional visit to Shey Palace, the 17th century royal residence built by the Namgyal dynasty. 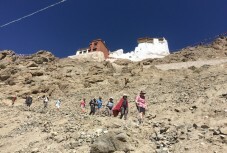 In the morning we walk (4.5 hrs) over a mountain pass to the town of Leh, where we visit the 15th century Tsemo Gomba, a hilltop stronghold that offers memorable views across the valley. After lunch there is time to explore Leh’s marketplace before driving back to our hotel (20 mins). Leh - Thiksey Monastery - Pangong Tso: An early start to drive southeast (30 mins) to the Thiksey Monastery, picturesquely situated on a small hill. At the monastery, we attend the monks’ Morning Prayer ceremony, which begins before sunrise at around 7am. After the prayers you will be guided to visit the other parts of the monastery, followed by breakfast. 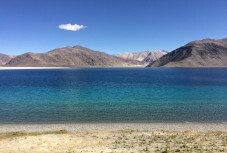 We then drive through remote valleys and over a high mountain pass to the isolated and astonishingly beautiful Pangong Lake, situated at over 4,000m on the Indian and Tibetan border (4.5 hours drive). A gentle afternoon walk along the lakeshore (5 miles, 2.5 hours) brings us to our secluded camp in a magnificent setting. 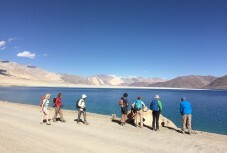 Pangong Lake – Diskit: In the morning we continue walking along the lakeshore venturing closer to the border to further enjoy the wonderfully contrasting lake/mountain views and the extraordinary tranquility of our surroundings (2.5 hours). We then drive (7 hours) to the Nubra Valley via the incredibly scenic Wari La pass, stopping en route for tea, lunch and to stretch our legs. 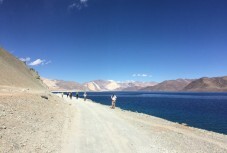 Diskit – Panamik - Ensa Monastery - Yarab Tso Lake - Sumoor - Diskit: We drive (1.5 hours) to Panamik. 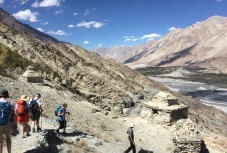 We begin our walk amongst the feet of the mighty Karakoram Range walking parallel to the Nubra River all the way to a small Monastery set in green oasis (2.5 hrs). 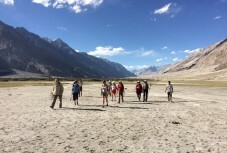 After lunch we drive to the Yarab Tso Lake – ‘Wishful Lake’ (3,300m/10,826 ft) where we enjoy another pleasant walk in the heart of the Nubra Valley (1 hour). 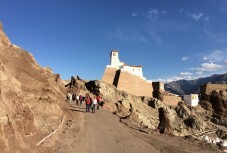 Finally, before returning to our hotel in Diskit, we stop and visit the Monastery in Sumoor. Diskit – Hundar Dok – Diskit: An early morning drive (1 hour by jeep) takes us up to the top of the Hundar Gorge and to the tiny village of Hundar Dok, where we begin our walk (3 or 4 hours, with shorter options available) following a glacier-melt stream past terraced farmland surrounded by the impressive peaks of the Ladakh and Karakoram ranges. After a hot picnic lunch at Hundar Dok we walk (8 miles, 3 hours) back down through a gorge, with shorter walking options available or afternoon at leisure. 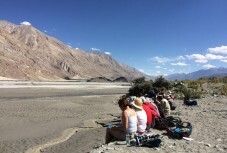 Nubra Valley – Khardong Pass – Leh – Basgo – Uletokpo: We drive (6 hours) to Uletokpo in the Sham Valley, stopping en route at the top of the Khardong Pass (18,330 ft – the world’s highest ‘motorable’ pass!) 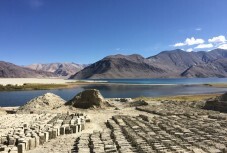 After lunch in Leh, we stop en route to visit the remarkable ruins of the fascinating town of Basgo, before continuing to our beautifully situated hotel overlooking the Indus at Uletokpo. Uletokpo – Yangthang - Rizong –Alchi – Uletokpo: After an early start we drive (1 hour) to the small (2-house) village of Yangthang, from where we walk (2.5 hours), following paths beside the river and through a gorge to the isolated and spectacularly situated Rizong Monastery (3,401m/11,158 ft), set in a natural amphitheatre. 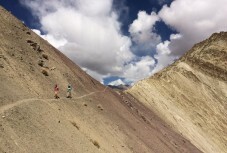 A more difficult walk (3 hours) over a high pass to Rizong is also offered as an option. After visiting the gompa, we walk down past the Chulichan (Chomoling) Nunnery (20 mins), before continuing on foot – (40 mins.) to the Ule Ethnic Resort. In the afternoon we drive to Alchi (25 min drive), the oldest Buddhist learning centre in Ladakh and an extraordinary National Heritage centre. Located on the banks of Indus River, it was founded in the mid-11th century by Tibetan translator Rinchen Zangpo. Uletokpo –Hemis Shukpachan – Tingmosgang: After an early start we drive (35 mins) to Hemis Shukpachan (3,645m/11,958 ft), from where we begin our walk (4.5 hours) to Tingmosgang - crossing a flat area to an ill-defined pass, marked with chortens (stupas). From here we traverse downhill before a steady climb towards the Mebtak La pass (3,720 m/12,183ft). 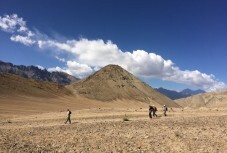 After admiring the view, we walk down to the village of Ang, then follow a jeep road on to the village of Tingmosgang (3,222/10,570ft), the 15th century capital of Ladakh, set in a fertile valley. After lunch we drive back to our hotel (25 mins.) 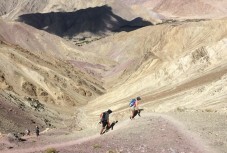 to relax, or walk up a spectacular gorge to a jewel of a village unknown even to most Ladakhis (3 hours). Ule Tokpo - Tingmosgang – Tia village - Lamayuru – Leh: We drive to the oldest village in the region. Tia village (3,394m/11,135ft) located on a hill, comprises of 200 families occupying medieval houses in a maze of alleys, tunnel streets, and courtyards. After exploring Tia on foot we walk up to the Bongbongla Pass, enjoying lovely views all along the way before gently descending to the Indus River (3.5 hours.) Reunited with the vehicles, we drive to Lamayuru (3,504m/11,496ft), noted for its 11th century monastery perched picturesquely high on a spur of rock, and former shrine of the Bon-chos religion prior to the advent of Buddhism. We then return to Leh by road (3 hours). Family-run boutique resort in spectacular setting. Leh- Matho- Leh: We drive (35 mins.) 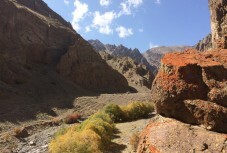 to the mouth of a forgotten gorge, which becomes increasingly dramatic as we walk towards the Zanskar peaks whose waters have carved it over the years. We walk back towards the Matho Monastery, where we enjoy unforgettable views of the Ladakh range mountains (5 hours, with shorter options). Free afternoon to relax or do last minute shopping in Leh. Departure Day: Transfer to Leh airport for a 1 hour flight to Delhi. The terrain is varied: farm tracks, lanes and mountain paths - some rough, stony and barren underfoot. There are no precipitous drops. We have kept the walking distances relatively modest as this allows us to acclimatise to the altitude and gives us time to experience the mountains. Please ensure you bring sturdy, well-broken-in walking boots with firm ankle support. ALTITUDE Please be aware that this trip involves a considerable increase in altitude, as it entails flying from Delhi (at sea level) to Leh (at 3,500m/11,500ft). Leh has excellent medical facilities (being also a military outpost) and should we have any problems with altitude we can manage these quickly and efficiently. Please note that fitness has no bearing on acclimatisation to altitude. There is no way to predict your acclimatisation rate (they vary every time one goes to altitude), but what is known is that it depends largely on rest and hydration prior to trip and for the first couple of days at altitude. For this reason the itinerary has been structured to allow for a gradual acclimatisation, with gentle sightseeing and walking activities at the start of the trip. In Ladakh barley and wheat are the staple foods, and there is a strong Tibetan influence. Most dishes are mild and vegetable-based, and are generally simple but very filling. Potatoes, beans, pumpkin and beetroot are commonly used in soups. Noodles may be added for a more sustaining meal. Momos – or dumplings – may be stuffed with vegetables or meat, and are served with hot chilli sauce on the side. There are also delicious breads, which may also contain meat. Butter tea, made of tea leaves, yak butter, water and salt is the drink of choice. It is taken from a bowl and its high calorie content suits the high altitude. Chang, the local brew made of fermented barley, is deceptively strong and very effective at warming the body! The exotic gurgur cha is made with fresh tea-leaves, with a dash of salt and butter or yak’s milk added – worth trying once! Ladakhis are heavy tea drinkers, though their traditional teas bear little resemblance to Western versions. Though the local population does not generally drink alcohol, there will be beer available with evening meals. Refreshing, cold fruit or milk-based drinks mixed with ice and sugar are delicious, thirst -quenching alternatives. What is the baggage allowance for internal flights? We had a stunning trip and it lived up to every expectation we had for ATG trips. I wanted to write to say how much we appreciated the trip and what (Tour Leader) Stephen did to make it work so well. Please thank the whole team for making this trip happen, and especially the addition of visiting Pangong Tso and staying overnight in yurts. This was a trip we could not have arranged ourselves and it was wonderful to be able to cover so much ground in out-of-the-way locations during the 14 days. It was a great group with a great team leader and we appreciated the opportunity to travel with you again. The trip takes place in September, away from the heat and bustle of the main tourist season of July and August. These are times of high social and agricultural activity when the villages are enveloped in either emerald or golden barley fields. 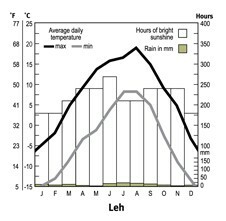 The Northern flank of the Himalayas does not get Monsoon rains (which take place in July and August to the south). This is a 14-day walking holiday with 11 days of walking plus sightseeing opportunities. The amount of daily walking varies from 2.5 to a maximum of 7.5 hours. Hours of walking, which may vary from group to group, means hours of actual walking and does not include stops for lunch, sightseeing, rests or siestas. 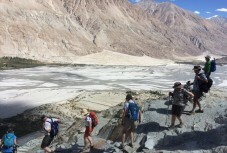 The terrain for this tour to Ladakh is mountainous, mostly stony and barren underfoot, and walking is sometimes on rough paths. There are no precipitous drops. We have kept the walking distances relatively modest as this allows us to work with the altitude and gives us time to experience the mountains. Please ensure you bring sturdy, well-broken-in walking boots with firm ankle support. Please be aware that this trip involves a considerable increase in altitude, as it entails flying from Delhi (at sea level) to Leh (at 3,500m/11,500ft). Leh has excellent medical facilities (being also a military outpost) and should we have any problems with altitude we can manage these quickly and efficiently. Please note that fitness has no bearing on acclimatisation to altitude. There is no way to predict your acclimatisation rate (they vary every time one goes to altitude), but what is known is that it depends largely on rest and hydration prior to trip and for the first couple of days at altitude. For this reason the itinerary has been structured to allow for a gradual acclimatisation, with gentle sightseeing and walking activities at the start of the trip. The destination airport for this walking holiday is Delhi. There will be a set meeting time at Delhi airport ; a set time for the return transfer to Delhi at the end of the trip; and a 'recommended flight' to connect with the airport transfers. Booking the 'recommended flight' - which we strongly encourage - guarantees transfers to and from the airports, irrespective of flight schedule changes or delays. For clients not on the 'recommended flight' we cannot guarantee a transfer from the airport should you be delayed for any reason in meeting the group at the specified place and time. In this instance you will have to make your own way to the first hotel, at your own expense. The transfer at the end of the trip will also be timed according to the recommended flight and we cannot offer transfers at alternative times. Please check with the Reservations Team before making independent arrangements. We strongly recommend that you pre-extend in Delhi to allow time to acclimatise and explore the city. Please contact the office for details of extension packages or hotel rates. If you arrive late and find that the group has left (there is no sign of them in the arrivals hall), please check for a message at the information desk and/ or contact us. The ATG office number is +44 1865 315 678 or outside office hours please call the emergency number which is +44 1865 315 600. Bring whatever clothes you find most comfortable for walking, including at least one pair of trousers as well as shorts. Warm and waterproof clothing is essential for this trip, as are sturdy walking boots with firm ankle support. Walking poles are advisable. Please do not walk in jeans, as these take ages to dry once wet; you can buy various (poly) cotton walking trousers from outdoors equipment retailers. We also recommend a long-sleeved walking shirt in case of cold weather, which allows you to perspire and dry, but still cuts out the cold wind (again, ask at outdoors shops for advice). You should ensure that you have a lightweight, warm, wind/waterproof jacket; please make sure that this is really waterproof, not just shower-proof. Waterproof over-trousers are desirable. Bring all possible protections against the sun: sun cream, hat, sunglasses, moisturiser. Shirts with collars are a useful protection against a sunburnt neck. India is a very conservative country and ‘short’ shorts and sleeveless ‘sun’ tops are unsuitable. Light informal clothing is most suitable for the hotels. Or see our general packing list below. The baggage allowance for the internal return flights from Delhi to Leh is 15kg for checked bags and 7kg for carry-on luggage. Charges for additional checked bags are US$9 (up to 5kg) and US$32 (up to 10kg). The location of lunches may vary, from picnics to meals in restaurants or private houses, or packed lunches for more remote walks. There is no need to dress up on this trip - the most important rule about dress is that it is conservative. Wearing revealing clothing is socially unacceptable. Though most casual clothes are fine, while visiting monuments, temples or old parts of any city, it is better to fully cover arms and legs. Yes. All foreign nationals require a visa to enter India. Visa fees are non-refundable. The High Commission reserves the right to decide the duration of the visa irrespective of the fees tendered at the time of making application. After the mandatory electronic filing of visa applications, applicants are asked to submit printed copies of their applications, photos, passports and fees to respective Indian Visa Application Centres (IVACs). Processing times vary at the sole discretion of the High Commission of India and its Consulates in the UK, and some applications may take longer than others to get processed. Please note that you may be asked to give a contact in India when you make your visa application. On booking we will provide this to you. While there are no strict dress codes, India is a conservative country - wearing revealing clothing is socially unacceptable. Though most casual clothes are fine, while visiting monument, temples or old parts of any city, it is better to fully cover arms and legs. The rule is that you eat with your right hand only. In India, as right across Asia, the left hand is for cleaning your feet and ‘sanitary’ functions, whilst the right hand is for eating, shaking hands and so on... The other rule to be aware of is that when eating or drinking your lips should not touch other people’s food – 'jhuta' or sullied food is strictly taboo. Don’t, for example, take a bite from something and then pass it to someone else to try. When drinking be sure your lips don’t touch the container. This custom also protects you from things like hepatitis. It is also customary to wash your hands before and after eating. As well as our scheduled group departures, this trip is also available as a private escorted trip. The recommended months to go are mid-September through mid-October. Our Reservations Team will provide a bespoke costing based on the number of people in your group and any special requirements. The destination airport for this walking holiday is Delhi. There will be a set meeting time at Delhi airport; and the group will return to Delhi airport from Leh on the last day of the trip. Please check internal flight times with the ATG office before booking your international flights. We strongly recommend you pre-extend in Delhi, with time to acclimatise and explore the city; and to allow some flexibility in the unlikely event that your international flight to Delhi is delayed. If you would like us to book pre- or post-trip extensions and associated transfers, please indicate this in the booking process.